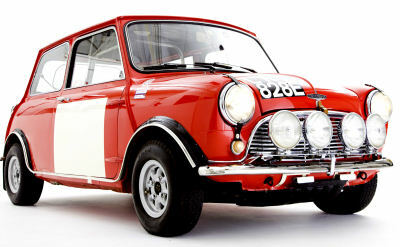 As early as1959, Minis joined MGAs and Austin Healeys in the BMC Competition Works rally team, based at the MG Car Company's Abingdon workshop. 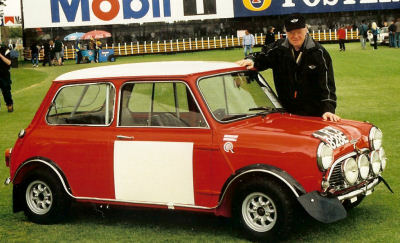 However it wasn't until the inclusion of the Mini Cooper in the1962 season that the Minis experienced success. No doubt BMC's signing of well known international drivers such as Timo Makinen, Rauno Aaltonen, Paddy Hopkirk and later Tony Fall contributed to this change of fortune, too. 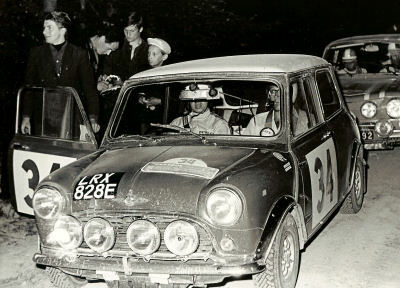 The Mini Coopers scored their first major outright win at the 1962 Tulip Rally, and by the mid-1960s BMC was the UK's undisputed rally king. 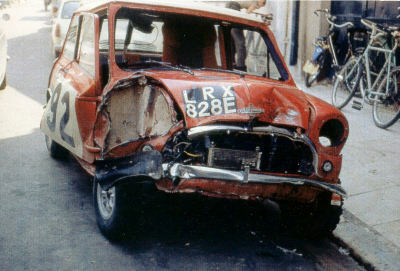 By1967 the MK1 Cooper S alone had snared more than two dozen major rally victories, including four consecutive Monte Carlo Rallies (although the 1966 team which took first, second and third places was disqualified for a lighting technicality) as well as an impressive list of class victories. Meanwhile, BMC's European rally drivers became household names and celebrities in their own countries. The most successful Works driver was Rauno Aaltonen from Finland. In 41 drives, he scored eight outright wins, two category wins, 14 class victories and the 1965 European Rally Championship. Results like these, combined with BMCs immaculate preparation and organisation, meant that rallying soon became the key publicity vehicle for the car companies. 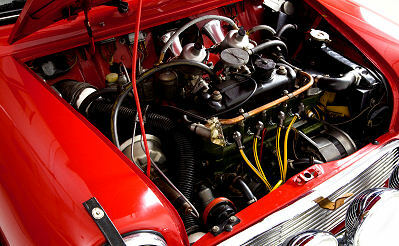 Between 1959 and 1970, a total of 71 works Minis were built at the Abingdon Works, including fifty 1275cc cars. Works Minis contested a total of 116 events, representing 263 individual entries, and the crews collected no less than 109 major awards. 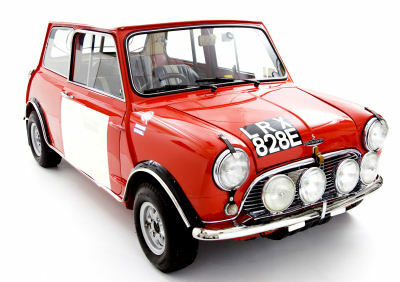 One of the Abingdon Works Minis which has survived beyond its competition life is LRX 828E. Specifically prepared for the 1967 European Rally Championship, it was primarily driven by Rauno Aaltonen and navigated by Henry Liddon (UK). However, success proved elusive. 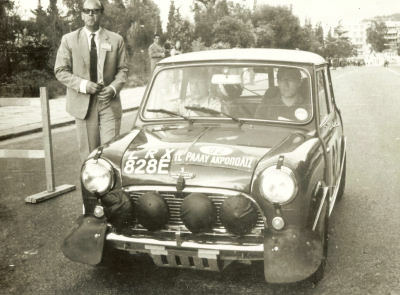 The 1967 Acropolis Rally was LRXs first International event, starting from the Acropolis in Athens with 56 hours of rough rallying and high temperatures facing the field. A head-on collision with a doctor's car travelling in the wrong direction on a special stage saw Rauno out of the event and Liddon in hospital. 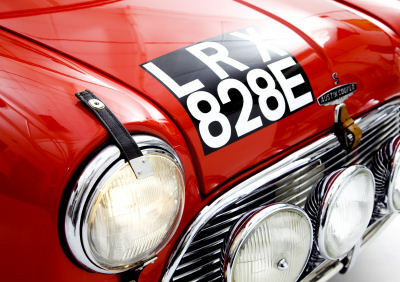 Some consolation was gained when sister car LRX 830E, driven by Paddy Hopkirk, went on to record a fine outright victory. Because of the extensive damage sustained, 828E was re-bodied and its identity transferred in time for the Danube Rally, an event starting in Prague and running over 2000 miles through the mountains of Romania. The car was in a winning position when it was barred from entering Hungary and disqualified, due to Rauno not having the appropriate visa. Victory this time went to another LRX car, the Works 824E Austin1800, driven by Tony Fall and navigated by Mike Wood. Towards the end of the European Rally season but in time for the 1967 Southern Cross International Rally, BMC Australia acquired the UK works cars LRX 828E and LRX 829E. 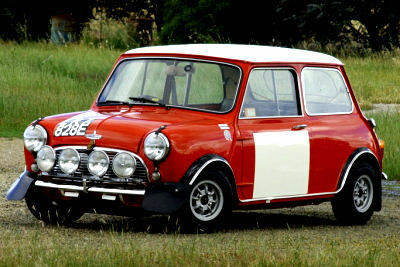 Going all out to win, BMC brought out Paddy Hopkirk and Timo Makinen to drive the UK cars and Tony Fall to drive a locally prepared 1275cc Cooper. But a first-up Aussie win was not to be for LRX 828E. Some 700 miles into the event, Hopkirk found himself left with only top gear. After being repaired, 828E was driven to victory in the Total Australia 500 Rally, by Tony Fall (with navigation by local Steve Halloran). The win was a testament to Fall's outstanding ability: driving 500 miles in blinding dust, he came from 123rd position and finished with a split fuel tank and a shredded rear tyre on which he had driven ten miles. By now repainted in BMC Castrol Green, LRX remained in Australia for the 1968 Southern Cross International Rally, where it was driven by BMC Australia's Evan Green and navigated by George Shepheard. Unfortunately, a broken gearbox at Sydney's Amaroo Park special stage put an end to its chances. Although not successful in international events, Evan Green and George Shepheard drove to many successes in Australian and State championships. Evan became one of the country's top rally drivers and achieved a fine second place with LRX 828E in the 1968 Australian Rally Championship. Stepping in for Evan due to illness, well known Australian driver Colin Bond took the car (which he had never previously driven) to outright victory in the 1968 KLG 300 Rally. A ban on rallying in New South Wales in the late 1960s prompted BMC Australia to sell 828E to Merv Collins of E Collins Motors (BMC dealers) in the Victorian country town of Ballarat. 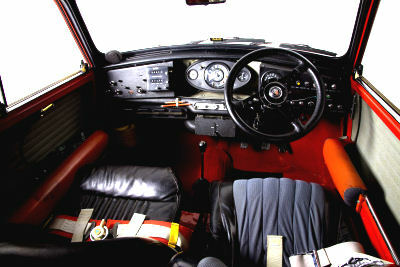 Campaigned by Collins, the car competed in Victorian Rally Championship and club events before being purchased by Graeme Urch in 1971. It has remained with him ever since. 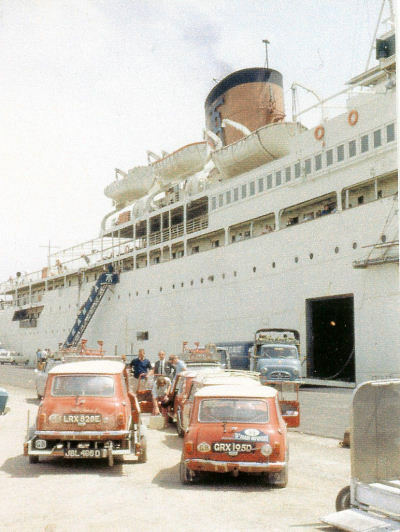 Graeme used the car for club rallies, and as a daily commuting vehicle for the next eight years. He retired the car when he realised its great historical significance was worth preserving. Despite several starts at restoration, the car lay in storage for years. It was not until the mid-1990s that Graeme decided to restore it back to its UK works condition. Considering the amount of competition work the car had done over the years, its body work was remarkably original and still retained most of the original Abingdon features. However, BMC Australia had made certain changes to suit the Australian outback conditions - changing to a milder camshaft, weber carby, taller diff ratio, seat belts, and rubber cone suspension. This all needed to be changed back to the UK Works specifications. The restoration was finally completed in early 2002, coinciding with a visit to Melbourne by Rauno Aaltonen, who was reunited with LRX at the Australian Grand Prix. Now restored back to Abingdon's famous Tartan Red and Old English White body colours, LRX 828E forms part of international motor sport's most successful era.